How Much Does Wainscoting Cost in 2019? Wainscoting can be a quick and budget-conscious way to liven up a plain wall and add some elegance to a room, but new DIY enthusiasts might wonder, “How much does wainscoting cost, really?” Most contractors charge between $1,000 – $5,000 to install wainscoting, which of course varies based on room size and the style of paneling installed. Doing the work yourself can cut this cost down significantly. To nail down how much it will cost for your project, you need to measure your walls and then calculate how much trim and other supplies you’ll need. This may sound like a daunting task, but there are easy DIY project calculators that can get you on your way. To understand how to calculate the trim and board you’ll need for your wainscoting project, it’s important to understand how all those elements work together. Wainscoting is basically decorative wood panels (or trim placed to look like panels) applied to the lower part of a wall. This decorative element can be as simple as a baseboard at the floor and an upper piece of trim running parallel to the baseboard called a chair rail. Wooden panels with beveled edges can be set between these pieces of trim, or more trim can be laid to create inset panels. As you can see, depending on the type of wainscoting you choose, there are different elements like trim or boards that you’ll need, as well as other supplies to create your paneled wainscoting. All these elements can seriously affect the cost of your wainscoting project, so plan your layout carefully. Let’s look at some elements that can affect how much a wainscoting or panel moulding project might cost. 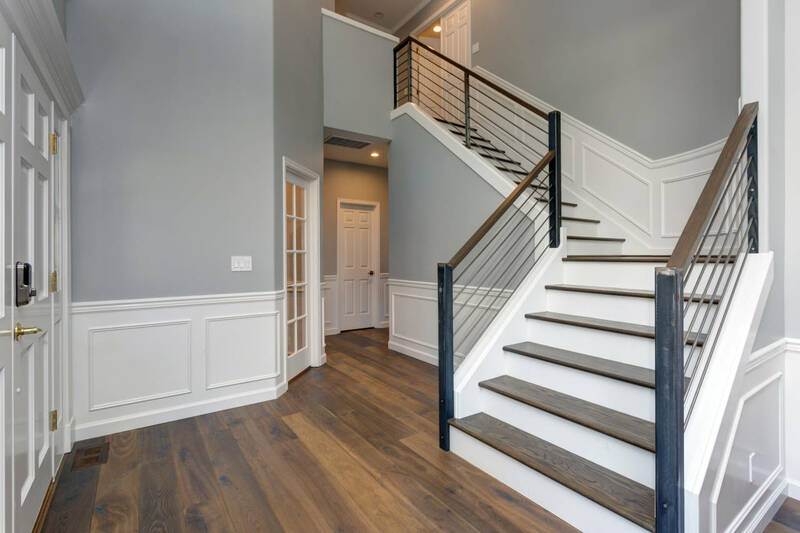 Wainscoting Style – Clearly the most important factor in the cost of your project is the kind of wainscoting you want to install. If doing a panel design, you’ll need flat boards for your panels, and if you want a beveled edge to these panels, you’ll need trim to create that effect. Even a simple type of wainscoting will require decorative moulding for the baseboard and the chair rail. Design Complexity – Some wainscoting designs can become incredibly complex, with different trims and mouldings all working together to create the look you want. Inset panels can be especially costly because that design involves lots of interlocking pieces of trim, and each inset panel can also have beveled edges or other decorative elements. Finishes – How you will finish your wainscoting also affects how much the project might cost. If you’re painting your decorative panels with one color of durable indoor paint, you might spend a little less than someone with a stained and sealed hardwood design. Type of Wood – Speaking of hardwood, many traditional wainscoting designs use high quality wood panels to recreate the antique charm of older houses. Certain hardwoods like oak or cedar have a lovely look but can also be very costly. Hardwood veneers can be somewhat cheaper, but you run the risk of peeling. Labor Costs – The cost to professionally install and paint your new wainscoting is of course a serious factor in your budget, and you should always get estimates and second opinions to determine a fair price. Knowing the total square footage of your project as well as having estimates of trim and panel footage can help you get an accurate estimate on your professional wainscoting installation. Hidden DIY Costs – You may be thinking, “Well labor costs are free if I’m doing it myself!” While you’re technically not paying yourself for your time, consider all the things that go into doing a wainscoting project yourself. You will need tools to complete the project, and many people forget things like nails or a sanding tool for finishing. You should also remember that you may mess something up, so you’ll need to order extra trim, moulding, and panels. All of these elements will affect how much wainscoting costs in your home. Whether you choose a trusted contractor or a DIY wainscoting installation, you’ll still need to do some basic calculations. The square footage of the wall you want to cover is the first thing you’ll need to do, but you should also estimate supplies. Having a good idea of the board footage of hardwoods and the amount of trim and moulding you’ll need is invaluable, even if a contractor is installing it for you. If you’re doing it yourself, of course this kind of information is crucial to answer the question how much does wainscoting cost.